Meatballs are a fantastic recipe for a family dinner or when you have guests over. Hearty and delicious, they are both kid friendly and complex enough to please every appetite. Having hungry teens to feed means that I am always on the look out for recipes that make enough food for dinner with leftovers to boot. This is just that recipe. They are always excited to hear that meatballs are on the menu…with mashed potatoes of course. One of my family's favourite supper dishes. Meatballs are always a hit. Mix ground meat, oats, milk, onions, salt and pepper. Roll into small - medium meatballs. Place on a cookie sheet and freeze for 5 minutes. Heat frying pan on medium/high heat with 1-2 Tbsp canola oil. Dredge meatballs in flour and fry until just starting to brown. 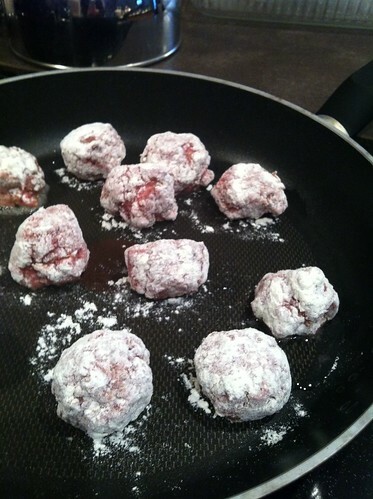 Place meatballs in a 13X9 pan that has been sprayed with cooking spray. Mix sauce ingredients and pour over meatballs. Bake for 45 minutes. This recipe easily doubles for bigger crowds though you may want to use a larger baking dish or separate the meatballs into two baking dishes. I never make anything with beef anymore, but these almost tempt me! I bet you could make them just as well with ground turkey. I think the oats and milk would keep them moist. You might want to kick the spices up a notch, though, because turkey can be a bit bland.